Use in craft projects, floral arrangements, mini trees in train settings, Xmas angels, draw on with chalk or paint them. Open ended on both ends, outside top 1-5/8" and bottom opening 2- 1/2" in diameter. Textured surface for easy handling, washable, and stackable. 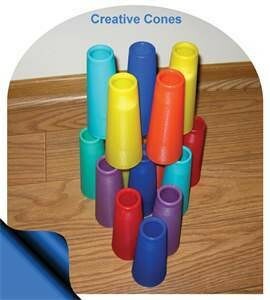 Stack and Build Cones on the left side then unstack them and restack on the right side for great hand and eye coordination and balance, stimulates the senses and use to practice color recognition and repeat play. COLORS VARY: Mixed, Black, Red, Blue, Yellow, or Green - green cones are variegated with black for a variety of different effects. Color combination produced at the factory and does not affect the use of the item. The option of solid green may not be available. All items are new.